It’s just what Xbox One has been waiting for: a glorious fusion of killer alien robots, over-excited Mayans, and online banana battles. 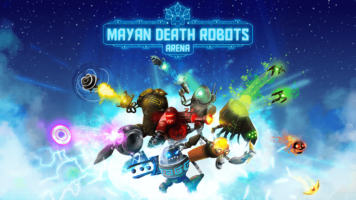 Yes people of earth, it’s Mayan Death Robots: Arena, out now on Xbox One for $6.99/6.99€ with online PvP, local PvP, and single player pandemonium. It’s anarchy in the South American subcontinent. Fans of alien robot banana battles and lesser-known Mayan truths will rejoice today, as Belgium’s finest Sileni Studios announces the official launch date and price of the super-upgraded, upcoming Mayan Death Robots: Arena for Xbox One. There are only so many times you can listen to those crazy Mayan predictions without crying wolf, but the credible folks at Sileni Studios in Belgium promise this one’s real: Mayan Death Robots is duelling its way onto PC via Steam this coming November 20th.